There has been a remarkable shift in the way education is being imparted across the globe. Technology, which for long had been the exclusive premise of realms above the understanding of general masses, has infiltrated our daily lives to an extent that one could not have imagined a few years ago. Far from being alien to it, the education sector has been one of the biggest adopters of the use of information and communication technology (ICT) as a tool for delivery. Innovation, for long a hallmark of good education, is now transforming the way education is being imparted worldwide. With a revolution in the way information is collected and disseminated, ICT is catching up as a medium of choice for educators in India. Several senior academicians that we got in touch with agree that the benefits of the use of technology are multifold for students and teachers alike. “Today, we are faced with the challenge of providing opportunities to the youth to receive appropriate education and unfold their full potential for meeting their aspirations. We recognise that technological tools, particularly computer, digital tools, Internet, etc., have immense potential to enable students acquire knowledge and skills necessary to succeed in the competitive global market,” says K P Mishra, Vice Chancellor, Nehru Gram Bharati Vishwavidyalaya (NGBU). For the uninitiated, there has been a concerted push from the Ministry of Human Resource Development (HRD) towards adopting technology-enabled learning and a separate division has been created for this purpose under the Department of Higher Education. Another major push in this direction has been the launch of the National Mission for Education through ICT (NMEICT). 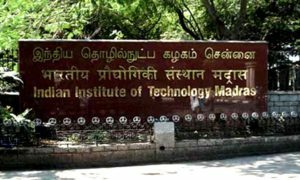 Under this mission, the National Video Server of the National Programme on Technology Enhanced Learning (NPTEL) was launched at IIT Madras in February 2011. The video server, aimed at making the entire NPTEL content available to students across universities and colleges online, is connected to 1 Gbps link of the National Knowledge Network (NKN) and to 155 Mbps link to the Colleges’ Virtual Private Network (VPN). The realisation that technology is relevant to the field of education and that it is growing in importance in today’s knowledge-based society is clearly present in all quarters. “An average person now changes at least 10 professions in his/her lifetime. In such a scenario, what is it that we can teach to enable our students to be future-ready?” asks Sunaina Singh, Vice Chancellor, English and Foreign Languages University (EFLU). The benefits of the use of ICT tools in education have also been debated and discussed at various forums and within institutions extensively. What has perhaps been missing in current times is the willingness and the ability to address the challenges that are hampering the implementation of technology-enabled learning. This significant innovation in education is disruptive and expensive and many institutes today are finding it tough to deal with the lack of required facilities and the high costs associated with it. Regulatory hurdles, erratic electricity supply and a mindset among teachers and students that resists change are some other bottlenecks that several institutions across India face in terms of implementing the policies devised by the government to encourage and facilitate technology enabled learning. “We are all geared up to deliver tech-enabled education, but often face difficulties in terms of adoption,” says Nupur Prakash, Vice Chancellor, Indira Gandhi Delhi Technical University for Women. Insiders tell us that there is also a lack of awareness among the institutions about the programmes of the government in this regard. Monitoring it is also a major challenge as there is no concrete data to suggest how far digital learning techniques have penetrated across in stitutions and colleges across the states. “In my experience, there are a few snags that need to be tackled for enhancing the impact of ICT on quality improvement of education,” observes K P Mishra of NGBU. “For example, infrastructure and manpower in various universities differ markedly. Therefore, plans of implementation of the ICT programme have to be executed in groups of universities with similar background and encourage them to catch up with better placed institutions,” he adds. Among other issues, he also calls for devising a plan for one-time special funding assistance to establish and improve infrastructure for technology-based teaching, training, learning and research for the accelerated implementation of NMEICT. Infrastructure and monetary issues only constitute a part of the problem. 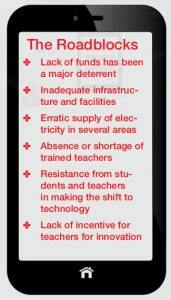 The major issue lies in the poor understanding of technology among teachers as well as students. “There is the danger of dwelling too closely on the use of technology and tools,” says Sunaina Singh of EFLU. “What is more essential is a change in our attitudes to the use of technology in the classroom, a commitment to think of education in a new perspective – one that is no longer handed down by the teacher, but is more collaborative and interactive in nature; one that is not compartmentalised, but aimed at developing transferable skills,” she suggests. These issues form a challenge for the government as well. Speaking of the implementation of ICT-enabled education in India, Praveen Prakash, Joint Secretary, Department of Higher Education and Mission Director, NMEICT, says that the major challenge of the mission is to enable and empower teachers in adopting a technology-enabled environment. “We have to support teachers in acquiring skills in e-content development and make them adept in the emerging modes of technology-based delivery,” he observes. “Another area that requires urgent intervention is to put in place a policy acceptable to all stakeholders for integrating technology-enabled learning as a part of curriculum and recognising degrees earned through the online mode,” he adds. His observations do hold true. Today, teachers who have become used to conventional methods find it tough to deal with this change. Moreover, lack of incentive to adopting these techniques is also missing from our existing framework and teachers, as a result, find it difficult to devote the time required for learning and adopting new age tools of teaching. 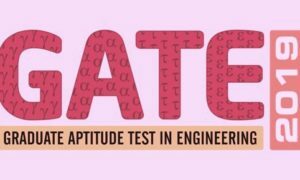 There needs to be an overall change in the mindset of the academicians for promoting the use of these technologies within the teaching fraternity and more importantly, among students. The world a decade from now will not demand the same skill sets that keep us going today. Moreover, with the demographic dividend that India is poised to be sitting on in the coming two decades, there will be a huge demand for quality manpower. This would require present students to be ready to face the demands of coming times. Technology- enabled education is an enabler in this direction and the benefits we are able to reap will depend upon how quickly we understand its effective and correct use and adapt to it. One must not forget that over 65 per cent of India still lives in villages and it is here that this revolution will have to reach to make the right impact if India has to be future ready. In a scenario where education still remains elusive to a majority of the population, the benefits of technology will have to be harnessed in expanding the reach of education and bringing a huge population into the mainstream. Running away from technology is no more the answer. Technology is here to stay and the onus of reaping its benefits now lies with the teachers and institutions. The sooner we get it, the better it will be for our society, our economy and our country as a whole.